TEMCO Engineering is the only company to offer comprehensive consistency training and product trouble shooting for all major consistency manufactures. A. What is Consistency, and how is it measured? B. Mechanical sensors, rotary and blade. C. Process variables which effect on-line measurement. The piping and control system. A. How piping impacts consistency measurement and control. B. Special piping considerations and transmitter mounting. C. How dilution water components effect the measurement. Consistency sampling, guidelines and techniques. C. Correct sample processing and evaluation to determine "true consistency". D. Proper meter calibration using hand samples. B. Off-line and factory pre-calibration. Rosemount® & ® HART Communicator and SMART Consistency Meters. B. Changing Curves, dampening, and ranges. Trouble shooting & preventative maintenance. A. Preventative maintenance for DeZurik®. B. Preventative maintenance for BTG®. C. Preventative maintenance for Valmet®. D. Preventative maintenance for TEMCO Magic®. 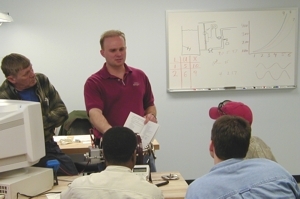 Training classes are held every six months in our Suwanee, Georgia facility. Suwanee is located 45 minutes from Atlanta's airport. Classes can also be conducted in your training facility. Please contact John Sobosz at (800) 898-3626 to arrange for training or for the next available class. DeZurik®, BTG®, and Valmet® are registered Trademarks. TEMCO Engineering has no affiliation with any of these OEM's. Rotating Sensing Disk Meter with faster response and improved reliability. Pre-Calibrated with SMART + HART. Rotating Sensing Disk, mounted in a side chamber with Pre-Calibration and SMART + HART. Motor 440 volts 3 phase or 117VAC. Special MAGIC III for pulp mill application, ideal for blow tank or hot black liquor. Fixed blade consistency meter with 6 blades for different furnishes and ranges. Pre-Calibrated with SMART + HART. Copyright © 2004-11, TEMCO Engineering, Inc. All rights reserved.